Android has a lot to offer for the technology enthusiasts. A smartwatch is just one of them. With a host of smartwatches available in the market, Mobvoi is one of the recent entrants from China that has revolutionized the budget smartwatch arena. In fact, the manufacturer has a host of smartwatches that have been able to perform flawlessly over the past few years. We will focus on two of their great offerings for the sake of this discussion. Let us compare and know more about the Ticwatch Pro vs Ticwatch 2 and understand the essential features that these two siblings have to offer to the Android Wear fans. How about a smartwatch that needs less amount of charging? That is precisely what Mobvoi has to offer with its range of Ticwatch brand of smartwatches. Of course, the screen tech is what you will see more extensively on Ticwatch Pro. The watches use an Android-based operating system that resembles the Android Wear. Labeled Ticwear OS, the software brings about most of the features available on Android Wear 2.0. Of course, the latest iterations of the smartwatches from the brand have embraced an all Google look and have been released for the worldwide audience through Kickstarter projects. The Ticwatch is available with a 42 mm dial and should be quite comfortable to wear. Launched in 2016, this model offers you a 1.4-inch screen. The 300 mAh battery should provide you with a backup of around 1.5 to 2 days. You can buy it in three color options like black, brown and white. You also have access to brown leather or stainless steel versions as well, but they will be a little more expensive. You have a resolution of 400 x 400 pixels at a pixel density of 287 PPI. The screen offers you brighter and deeper colors. It offers you a few features that you may not find on Google’s Android Wear. One such feature is a multidirectional swiping option. The notifications are interestingly aesthetic compared to the Android Wear. The interface is easy to use and simple to understand. You have access to preinstalled apps like Dialer, Calculator, Calendar, Fitness, Recorder, Timer, and Alarm. You can choose among a host of watch faces – some quite simple while a few quite complicated. The voice controls are through Ticwear OS and are triggered by an OK Tico hot word. The voice recognition is entirely accurate and on the dot – most of the times. You have health and Fitness apps preinstalled, and can configure them with Google Fit, Runkeeper, and Strava. You also have access to on-demand heart rate monitor for your needs. You can install apps from Mobvoi App store. You can download your favorite apps with ease. However, a few apps come up with an alert in Chinese. The 300 mAh battery should be capable of lasting around a day and a half. If you are looking to an excellent battery backup without limiting the functionality of the smartwatch, A dwindling battery backup is what can be a disadvantage you may find concerning the mechanical and other similar watches. Mobvoi calls this a smart screen technology and addresses this issue in a considerably simple manner. In fact, this will help you push the charging time to as high as 30 days! Ticwatch Pro comes with two screens. It consists of the OLED display that works on the Google Wear and the second screen over it. The first screen works with Wear OS while the second screen will show you time, date, step count, and battery status. This is comparable to Ambient light mode. When the watch is using both the screens simultaneously, you would be able to get two days of battery backup. The Essential Mode will let the LCD mode to remain active while shutting down the OLED and Wear OS mode. The low battery capacity is capable of providing you with a backup of up to three days. 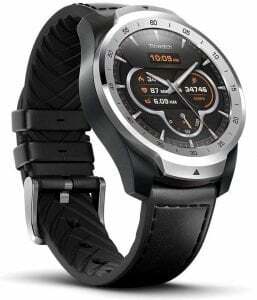 Qualcomm Snapdragon 2100 platform powers Ticwatch Pro. You have access to a 400 x 400 display at 407 pi pixel density. The 1.39-inch screen is set in a body that is 12.6 mm thick. A 415 mAh battery capacity powers the watch. You also have an IP 68 level water and dust resistance. In sharp contrast to the Ticwatch 2, the newer Ticwatch Pro is an entirely Google-powered device. The smartwatch runs on Google ‘s official Wear OS ( formerly called Android Wear) and has access to Google Play Store and Google Assistant. In addition to the official Google Fit health and fitness app, Mobvoi has also added its app in the genre. The Essential Mode is expected to get updated with newer features in the future. However, the Wear OS seems to have a few issues when it comes to the performance. Almost all the problems we faced were directed at the Google’s Wear OS rather than the functionality of Ticwatch Pro. Google Assistant fails to work on many occasions. The interface is a little slow to respond. Ther is a constant update request to use one of the own apps from Mobvoi. We would be happy if Google soon came with an update to sort things right. In essence, we would consider it to be a great smartwatch in its own right and the battery life tweak through an intelligent screen is indeed commendable. Wear OS is an issue and we expect almost watches with it – irrespective of the manufacturer – to find the problems affecting them. 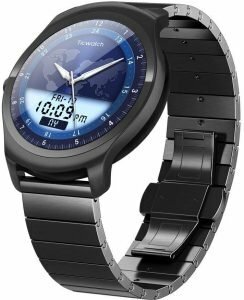 How does Ticwatch Pro vs Ticwatch 2 Compare with Each other? Well, the above introduction would have clearly differentiated the two smartwatches from Mobvoi. Even then, to having a proper understanding of the two siblings, we will check them out in a tabulated comparison. Well, the two devices come with a huge difference as such. The Ticwatch Pro is essentially a complete Google product unlike the Ticwatch 2. Complete integration with Google is, in fact, something we found interesting enough. However, the smartwatch suffers regarding better responsiveness, but as we have already pointed out – the issue is obviously from the 2-year-old Qualcomm chip inside. We may hope for a polished interface and functionality from Google in future updates. The smart screen design to improve battery backup is indeed a very thoughtful idea. Also, what makes it even more important is the fact that the technology works! The display and the design elements impress on both the smartwatches alike. 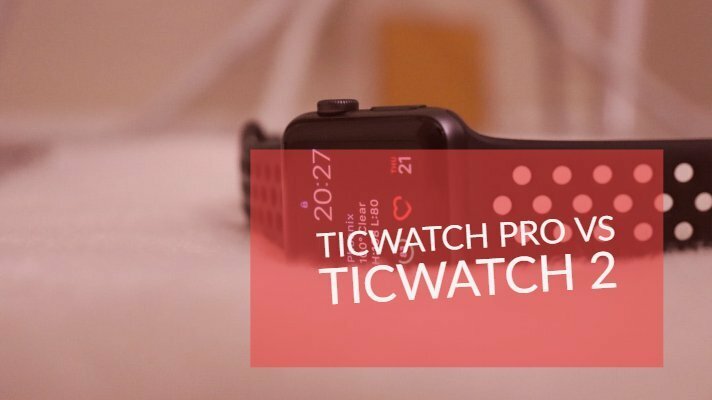 We found the operative system a bit more slick on Ticwatch 2 than on the modern Ticwatch Pro. Rest all, the latest variant in the form of Ticwatch Pro impresses.